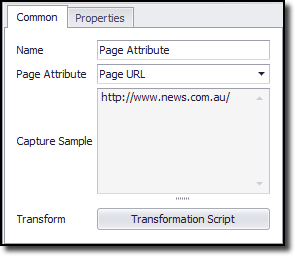 Use this command to extract general attributes from the current web page, such a page URL or page meta data. Click the Transformation Script button to enter regular .NET expressions or write a .NET script that will transform the attribute value to meet your requirements. See the Content Transformation Script topic for more information about content transformation scripts.